Images © 2005 Frank Glackin except where noted. I always had wanted a model of Juno I, the Jupiter C rocket that launched America's first satellite. It needed to match all the other rockets and spacecraft that are available in 1/144th scale. The Jupiter C, complete with gantry, was one of Revell's earliest and most popular spacecraft, but it was in 1/110th scale. It was not until 2002 that New Ware released the first 1/144th scale kit of this important launcher. The New Ware kit was well worth the wait. Juno I is priced at only $15 which is an excellent value. The kit (NW0038) is a perfect weekend project. Actually it was two weekends since I let the assembled missile dry during the weekdays after it was airbrushed gloss white. The rocket that launched America's first satellite has several names including; Juno I, Jupiter C and Explorer I, which will be explained in describing its history. In 1951 Werner Von Braun and his team started development of the Redstone missile as the first Intermediate Range Ballistic Missile (IRBM). The Redstone had a range of about 200 miles and used liquid oxygen and alcohol as fuel. In June 1954 Von Braun proposed Project Orbiter in which the Redstone would be modified to launch a satellite. The proposal was rejected since it was premature. When the United States decided to launch a satellite announced that it would orbit a satellite it concentrated on the Vanguard which was being developed by the Naval Research Laboratory, rather than the Army's Redstone. One of the reasons for choosing Vanguard was that it was a new rocket that had not been developed as a weapons system, as was the case with Redstone. Von Braun, however, continued development of the Redstone as a launcher to test the re-entry of nosecones on high speed flights. The American government still hoped that the Vanguard project would launch America's first satellite. The Vanguard satellite was the size of a softball with a diameter of only 6.4 inches and weighed only 3.5 pounds. Unfortunately, on December 6, 1957 in full view of the world's cameras, Vanguard I exploded on the launch pad. 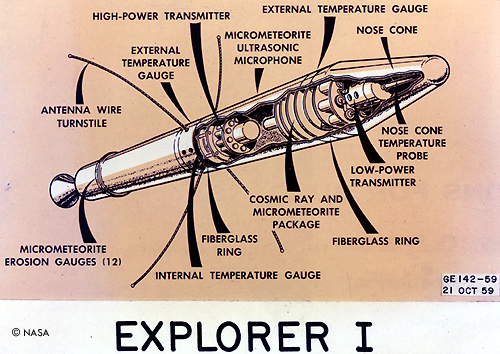 The Jupiter C was further modified to launch Explorer I as America's first satellite. 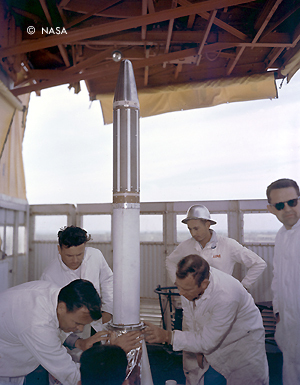 Three more stages were placed atop the Jupiter C in order to reach orbital velocity. 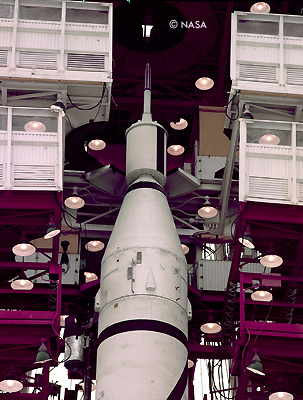 The Juno I launcher was 71.25 feet tall with a diameter of 5.8 feet. The entire rocket weighed just 64,000 pounds. The single Rocketdyne A-7 engine in the first stage developed 83,000 pounds of thrust. The second stage consisted of 11 Sergeant solid fueled rockets in a circle. The second stage had a combined thrust of 16,500 pounds. The third stage was three more Sergeants that were within the circle of Sergeants of the second stage. In the center was the fourth stage, a single Sergeant that was attached directly to the Explorer I satellite. These four Sergeants each provided thrust of 1800 pounds, which was sufficient to propel Explorer I into orbit. The three top stages were spin stabilized. 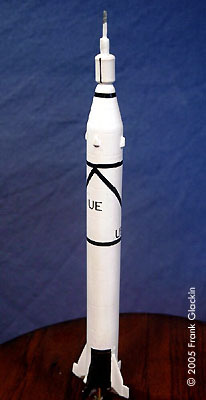 The configuration of the Jupiter C and the three upper stages of Sergeant rockets was named the Juno I launcher. The Juno I was launched six times of which four successfully orbited satellites. Just 84 days after being given the go-ahead, Juno I launched America's first satellite into orbit on January 31, 1958. Explorer I weighed only 30.8 pounds and had a length of 6.66 feet, including the Sergeant motor, with a diameter of about 6 inches. The satellite was designed by the Jet Propulsion Laboratory under Dr. William Pickering. The instrumentation section included a cosmic ray detector, temperature gauges and a micrometer detector. Juno I launched the Explorer I satellite into a 225 to 1,594 mile high orbit and it did not re-enter for 12 years until 1970. Almost immediately Explorer I made an outstanding scientific discovery. The satellite's instrumentation determined that the earth was surrounded by a series of radiation belts formed by the earth's magnetic field. They were named after Dr. James Van Allen, who was one of the principal investigators. The Sputniks had also detected higher radiation at different altitudes, but the Russians did not properly analyze the data until after Van Allen announced his discovery. Explorer I also determined that the threat from micro-meteors was less than some scientists anticipated and should not pose a threat to most satellites. Explorer I was the just the first in the longest series of American satellites, which included 55 Explorers. The first five Explorers were similar to Explorer I. Special Hobby, which casts most New Ware kits, created flawless castings that only required removal of the pour plugs. The four fins have razor sharp leading edges. The directional control vanes are attached to the bottom of fins and care should be exercised in not damaging them during assembly. The first fin was placed according to the diagram in the instructions. In order to obtain perfect alignment of the four fins a circle gauge was used. 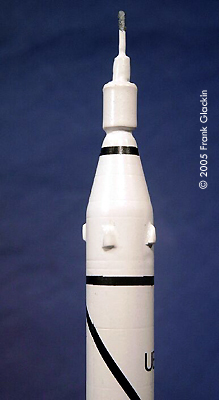 The cylindrical rocket body was placed through the proper diameter hole and the location of the four fins coincided with the 90° intervals of the circle gauge. An additional aid in assembly was the overhead view of the rocket in the instructions. It shows the correct position of the fins relative to the two molded projections between the fins. The second, third and fourth stages consisting of the Sergeants is beautifully cast as one piece. The casting is ingeniously wrapped separately to protect it during shipping. The top is a resin spike representing the fourth stage of the Sergeant motor and the Explorer I satellite. The top of each of the 11 Sergeants in the second stage is accurately represented. I elected to replace the spike with stainless steel tubing to assure its longevity. Conveniently, the metal nozzle of a container of Humbrol liquid cement was almost the right diameter, though a hypodermic needle could be used as well. In retrospect, the transition of the spike should be more conical. There are four photoetched aerials that are attached to the top of Juno I according to the diagrams. A very nice feature of many New Ware kits is that extras of certain small parts are included as spares. Since the aerials are very small, New Ware includes six aerials, although only four are needed. The New Ware instructions include views of all four sides of the rocket. Certain of the fins and the areas between them are painted black to create the roll pattern. All the information is in the drawings and only a few minutes are needed to determine the proper sequence of black and white segments. All the fins were masked readily and then airbrushed with Testors gloss black. The small directional control vanes at the bottom of the fins were painted dark red-brown, which was a mixture of red and rust. The section of the fins holding the vanes and the bottom of the rocket were bright bare metal. Testors Metalizer exhaust was used to paint the rocket engine itself. All that remained were the decals. New Ware prints the decals for the Juno I on the same sheet as those for the companion kit, the Jupiter C Discover 4 launcher (NW0039), which launched the first object that was recovered after re-entry. 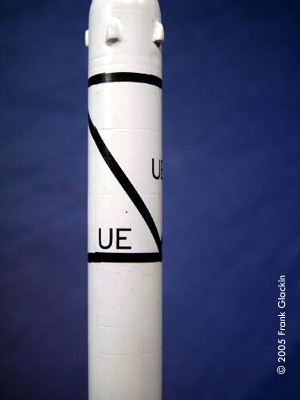 The markings for the companion Jupiter C differ only in using the letters “TX” rather than “UE”. The instructions thoughtfully suggest to apply the extra decals as a test on the completed model to determine the proper fit. Proper alignment of the decals was made according to the four views in the instructions. Following this suggestion, the entire roll pattern of the rocket was applied easily using the second set of correct decals. New Ware's decals are printed by Avi Print, which supplies most of the decals for Eduard and MPM. The decals are just the right thickness. They are strong enough to be able to be adjusted while applying them to the model, yet are thin enough to conform to all the details. 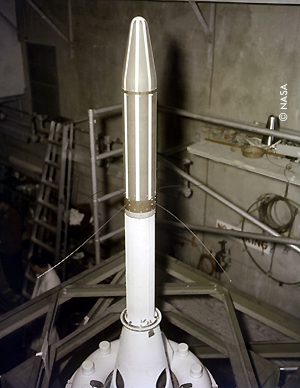 The photos of the completed missile include two views to show the roll pattern formed by the decals and the black and white portions of the fins. An earlier photo shows how Juno 1 was dwarfed by the Russian R-7 booster. 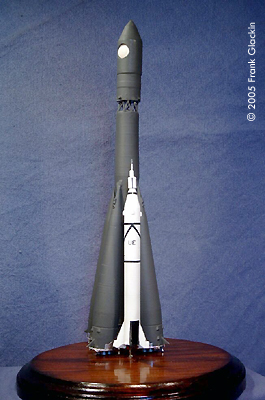 In this case the R-7 is the version used to launch Vostok and was built from the Apex/AER kit. The New Ware Juno I kit produces a very accurate replica of one of the most important rockets in space history in just a few hours. It was highly enjoyable building such an accurate kit in just two weekends, aided by smooth castings and excellent instructions. The Juno I was so enticing that I will want to add the three other variants of the Redstone, (Jupiter C NW0039, the Redstone Tactical Missile NW0040, and the Australian Sparta Redstone NW041), produced by New Ware to my collection. This page copyright © 2005 Starship Modeler. First posted on 3 November 2005.